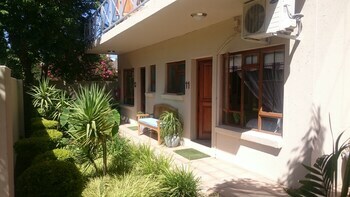 Located in Douglas, Rene's Guest House is minutes from Nederduitse Gereformeerde Church and Telkom Park. The front desk is staffed during limited hours. Free self parking is available onsite. Located in Adendorp, Jesa Accommodation and Camping Grounds is within a 15-minute drive of Graaff-Reinet Dutch Reform Church and Camdeboo National Park. Free self parking is available onsite. With a stay at Traveller's Joy in Colesberg, you'll be a 4-minute walk from Colesburg Church and 5 minutes by foot from Colesberg Museum. Free self parking is available onsite. With a stay at Pettigrew s Place in Pennington, you'll be within a 15-minute walk of Selborne Park Golf Club and Selbourne Golf Estate. Free self parking is available onsite. Located in East London, MacKenzies Accommodation is within a 15-minute drive of Eastern Beach and Bonza Bay Beach. Free self parking is available onsite. When you stay at JW Cottages in Underberg, you'll be 7 minutes by car from Reichenau Mission. The front desk is staffed during limited hours. Free self parking is available onsite. With a stay at 6 on Morris Guest Lodge in Sandton, you'll be within a 15-minute drive of Montecasino and Kyalami on Main. Free self parking is available onsite. With a stay at Echelon in Cape Town (Sea Point), you'll be close to Signal Hill and Table Mountain. With a stay at Serenity Lodge in Cape Town (Cape Town City Centre), you'll be within a 10-minute drive of South African National Gallery and Castle of Good Hope. Free self parking is available onsite. With a stay at 15 Woodford in Cape Town (Camps Bay), you'll be within a 15-minute drive of Table Mountain and South African National Gallery. Free self parking is available onsite. Located in Hermanus (Kwaaiwater), Four Pines Lodge is within a 5-minute drive of Voelklip Beach and Grotto Beach. Free self parking is available onsite.